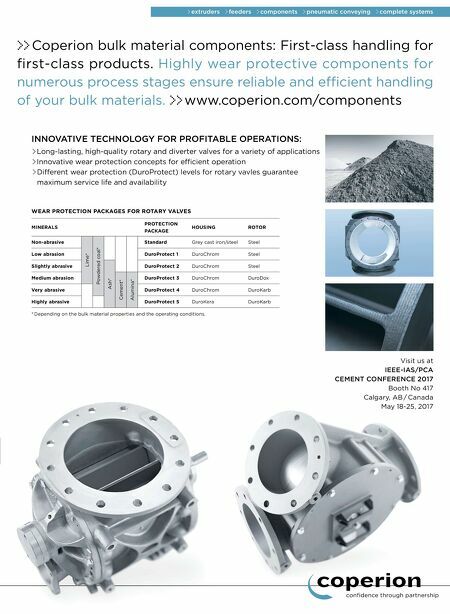 Visit us at IEEE-IAS/PCA CEmEnt ConfErEnCE 2017 Booth No 417 Calgary, AB / Canada May 18-25, 2017 >> Coperion bulk material components: First-class handling for first-class products. Highly wear protective components for numerous process stages ensure reliable and efficient handling of your bulk materials. >> www.coperion.com/components > extruders > feeders > components > pneumatic conveying > complete systems InnovAtIvE tEChnology for ProfItAblE oPErAtIonS: > Long-lasting, high-quality rotary and diverter valves for a variety of applications > Innovative wear protection concepts for efficient operation > Different wear protection (DuroProtect) levels for rotary vavles guarantee maximum service life and availability WEAR PROTECTION PACKAGES FOR ROTARY VALVES MINERALS PROTECTION PACKAGE HOUSING ROTOR Non-abrasive Lime* Powdered coal* Standard Grey cast iron/steel Steel Low abrasion DuroProtect 1 DuroChrom Steel Slightly abrasive Ash* DuroProtect 2 DuroChrom Steel Medium abrasion Cement* Alumina* DuroProtect 3 DuroChrom DuroDox Very abrasive DuroProtect 4 DuroChrom DuroKarb Highly abrasive DuroProtect 5 DuroKera DuroKarb * Depending on the bulk material properties and the operating conditions.